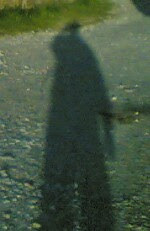 My shadow. The first person I greeted every morning during the camino. When he starts to appear behind me, then it's time for me to stop walking for the day. The purpose of this blog is to document down my journey. I had taken hundreds of photos with my cameraphone and this is a perfect avenue to share it with all the pilgrims or would be pilgrims. This way, I am also walking my camino for a second time virtually. On my Camino Via de la Plata, I have updated the blog almost daily whenever I can find an open wlan either in a cafe or at the local library. You can find out more about my other online ramblings at straydog scraps where I write about things that are not as serious. 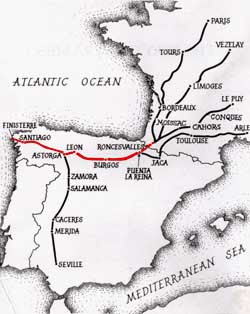 I started my Camino de Santiago on April 28th 2006 when I arrived in the town of Roncesvalles around the border between France and Spain. The following 29 days it took me to walk to Santiago de Compostela has been something which I could not just keep within myself. Hence, I created this site to express myself and share my experiences. It is my hope that I am able provide inspiration for others who have decided to embark on this wonderful journey of self discovery, religious or otherwise. I have notice that there are many sites in the internet by ex-pilgrims. Most of their sites are quite static and are probably done right after their camino. Updating web sites can be quite a chore, and it is understandable that most of their sites are not updated frequently. Because of this, I have decided to use Wordpress (blog) for this site. This will allow me to create entries easily when I needed to. This site is still work in progress, and I hope to be able to get it to some semblance of usability in the next few months. As they say, 'The Camino starts when the walking stops'.